Received December 24, 2012; Accepted Feburary 19, 2013; Published Feburary 20, 2013. Figure 2. Germination and dormancy as related to the seed maturation gradient within Lepidium papillosum infructescences. 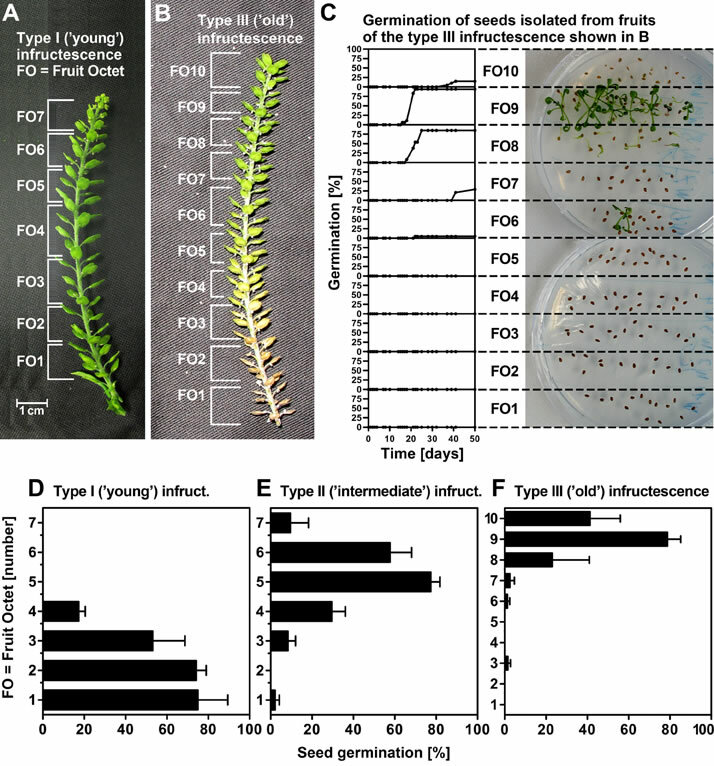 A-C, Experimental separation of type-I ('young') and type-III ('old') infructescences into fruit octets (FOs) and FO-specific analysis of their germination time courses. Note that lack of germination in bottom-part FOs (low numbers) is due to primary dormancy whereas lack of germination in top-part FOs (high numbers) is due to immaturity of seeds. C, Exemplary seeds from type-III infructescence incubated on germination plates (images at day 39) and germination kinetics. D-E, Final germination frequency gradients indicative for primary dormancy induction of seeds from FOs of type I ('young'), II ('intermediate'), and III ('old') infructescences. Mean values ± SE of 4 type I, 6 type II, 4 type III infructescences from different plants; final germination percentages were taken from FO (each containing 8 fruits and thereby 16 seeds) time course analyses at 50 days.